This entry was posted in Courage, Persistence and tagged Compassion, Courage, Encouragement, Inspiration, Kindness, Life, Persistence, Spirituality, Strength, Wisdom. Bookmark the permalink. 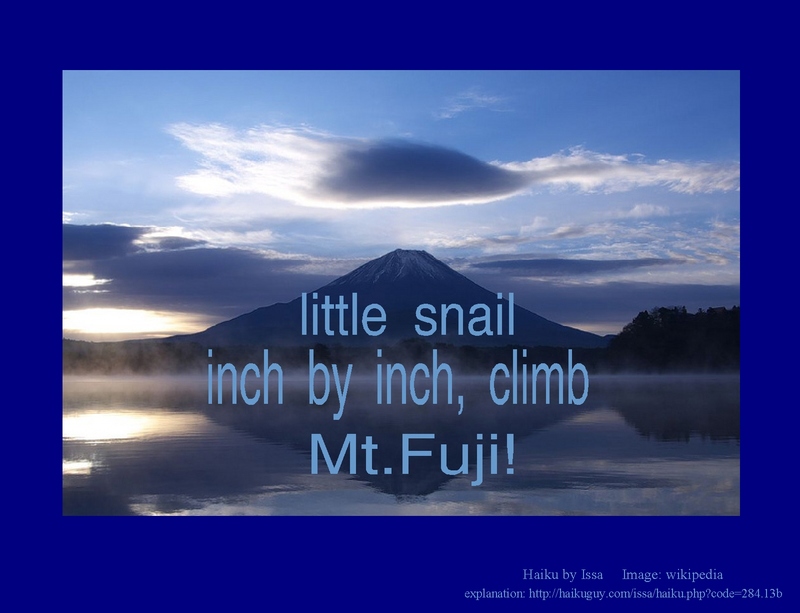 It’s a wonderful haiku ….uh oh, I see I misspelled “haiku” on that page… ah, little snail. that will take forever for the snail to reach the top should it survive the elements. Love the metaphor. ah yes….little snail on a lifetime path…. there we all are with it, too. Inch by inch . . . life’s a cinch. Yard by yard . . . life is hard. keeping my head down… taking it inch by inch! This reminds me of one of my favorite Quotes … “With perseverance, even the snail made it to the Ark!” 😀 Thank you for the timely reminder. I had missed this post! This is a great reminder for me as patience is not one of my virtues, but working on releasing this . When I get impatient with goals, I will remember the snail. ah yes….patience… an ongoing challenge for me too… trudging up Mt.Fuji. Oh, I forgot about “joyful effort”…. not trudging. And, isn’t it remarkable what we can learn as we open to guiding our children along???? …along with guiding ourselves, too. Oh goodness, it sounds like you have some ongoing health challenges…I wish you well.